If you are a new reader, first of all, welcome, and please allow me to catch you up to speed. 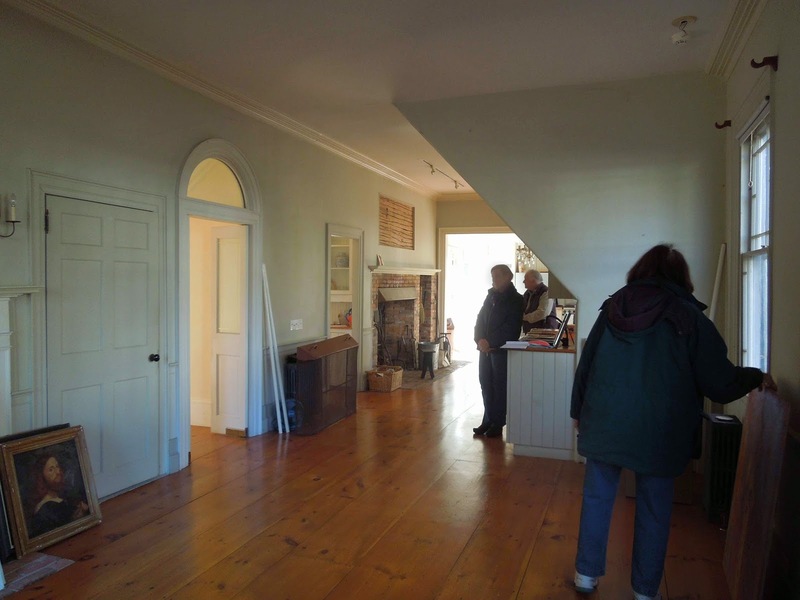 After an extensive search for a vacation home, Tom and I finally found - thanks to realtor Karen Koos of Saltmeadow Properties - a historic gem in Castine, Maine. Maintenance had unfortunately lapsed on our 1804 home. The last few years were unkind and especially harsh - much TLC was needed. Well, it's been just over four months since closing, and the house already looks much better thanks to an amazing team. 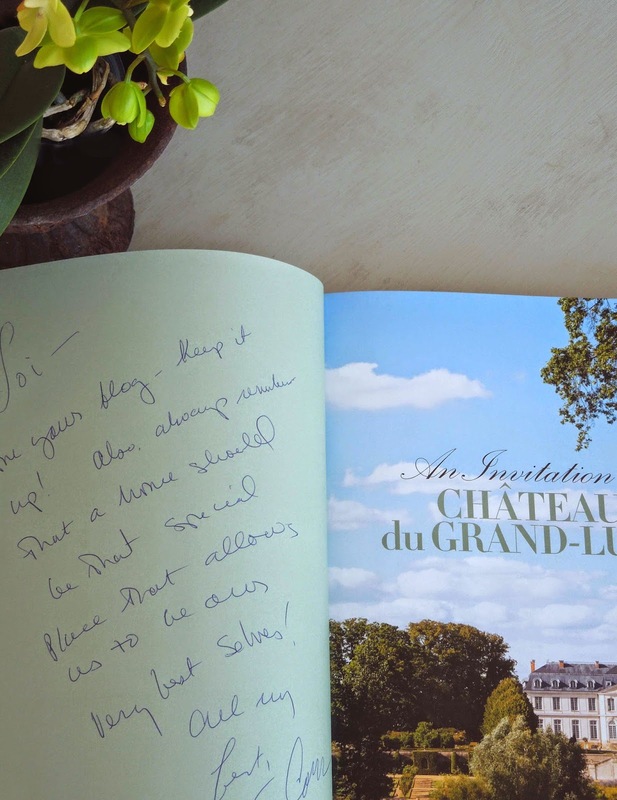 Before I show the work of these talented craftsmen, I'd like to share a special book I received from the worldly Timothy Corrigan via a giveaway hosted by Jennifer of The Pink Pagoda. Many thanks to Timothy and Jennifer! BTW, are you familiar with The Pink Pagoda's online store featuring stylish prints, original art and gracious home accessories? Don't miss the lovely collection of Chinoiserie blue-and-white pieces. My favorites are the ginger jars. Now let's check out the progress at Castine. ABOVE: All the walls and trim in this guestroom were in desperate need of a good scrubbing and fresh coat of paint. Even the pine floors looked a bit yellowy. Newly painted! 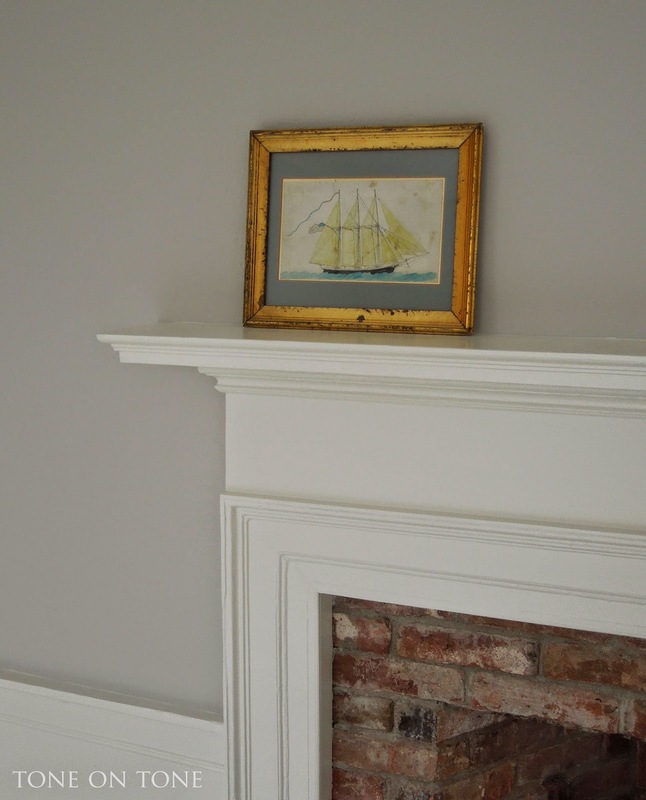 I chose Benjamin Moore Wickham Gray for the walls - a soothing mid-tone gray. The trim is Benjamin Moore 75% White Dove in satin impervo low lustre. Floor is a custom color with a glossy sheen. Our wonderful and meticulous painter, Dan Bergin, applied the paint with a roller and, then immediately, brushed it out so we wouldn't have that roller texture. Dan and his crew at Bergin Painting did an incredible job throughout the house. Have you ever painted a 210 year old house? It's no easy task. Tom and I couldn't be more pleased with the awesome work by Dan and his team! Here is another bedroom with the same color scheme. Wickham Gray looks historic yet fresh and relevant. Its neutral spirit is a lovely backdrop for gilt, whether gold (below) or silver (see first photo at top). 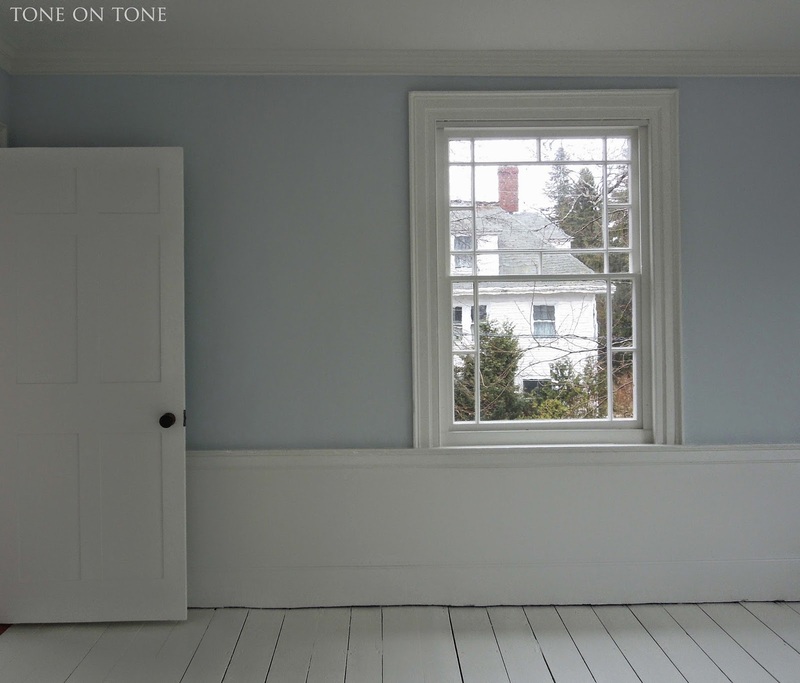 For another bedroom, the walls are painted Benjamin Moore Gray Sky - a true sky blue. This room gets endless sunshine so the blue is tempered by the bright light. On cloudy days it can read a bit pastel, which is fine because we want it to always feel cheerful and summery. 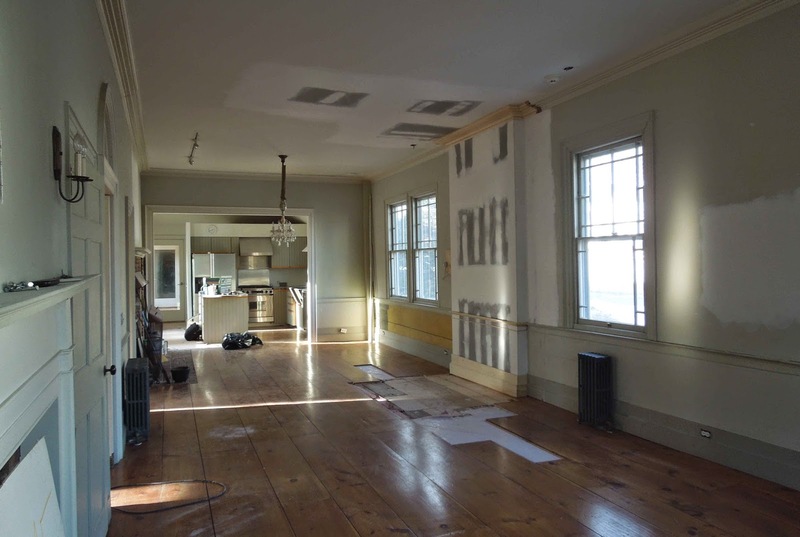 ABOVE: A "before" photo showing the family and breakfast rooms - notice the back staircase dividing them. This staircase was concealed in a closet, and had been abandoned (covered over) by the previous owners. Tom and I decided to have it removed to open these rooms. Two work in progress photos. BELOW: Ta-da! Staircase gone; floors patched; trim matched; and surfaces freshly painted. 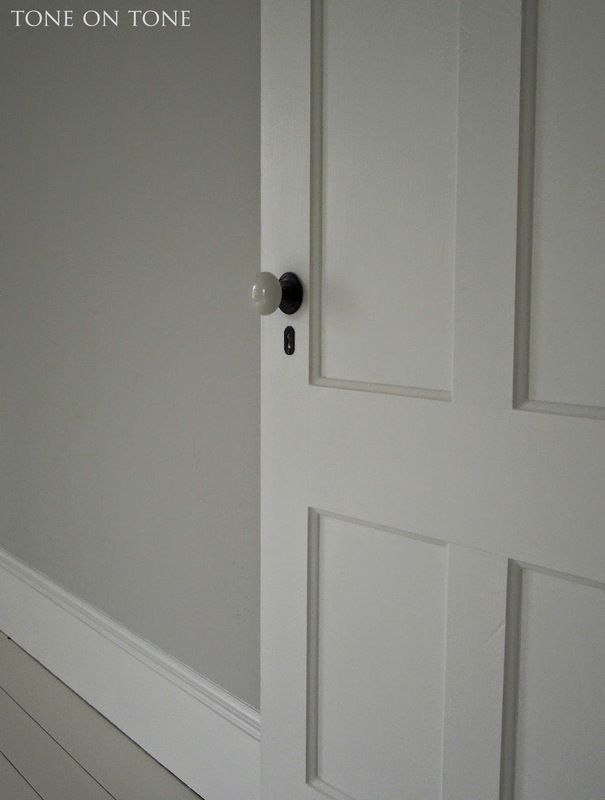 Because this is an old house, I chose a soft white that's easy on the eye. Walls are in Benjamin Moore White Dove and trim is 75% White Dove. 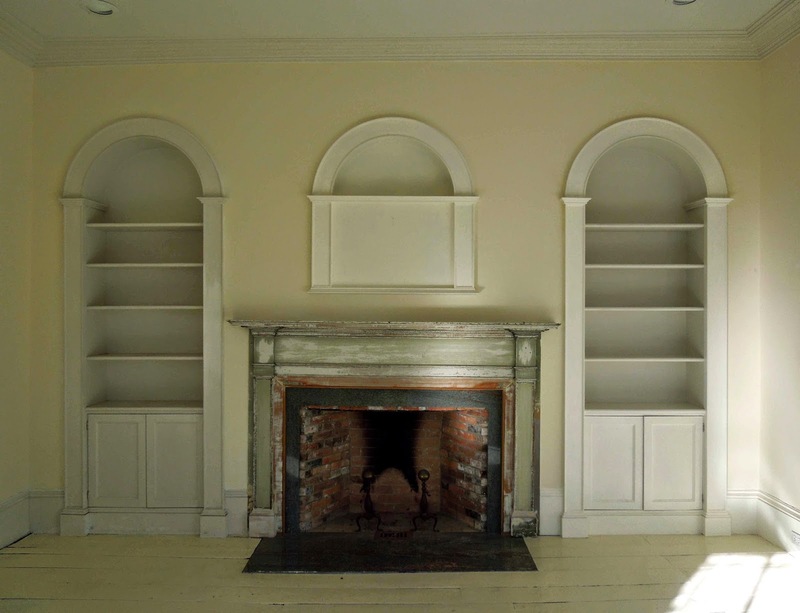 ABOVE: A "before" photo of the yellow living room with an arched over-mantel niche. BELOW: The living room now without that fanciful niche - simple and clean. We're keeping the window treatments very simple: half shutters on the bottom throughout the first floor. 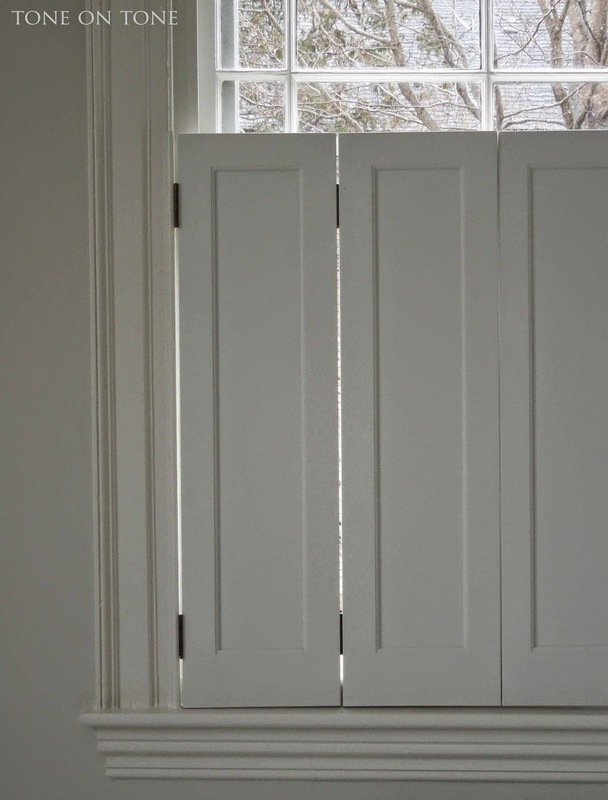 The wider windows received two sets of bi-folds (BELOW) while the narrower ones (ABOVE) were fitted with two single shutters. Just like kitchen cabinet doors, I prefer recessed paneling with a simple bead to keep it from looking too Shaker. And, I always insist on the bottom rails be stacked / weighted. It was quite a challenge to hang the shutters as the windows had settled so unevenly. 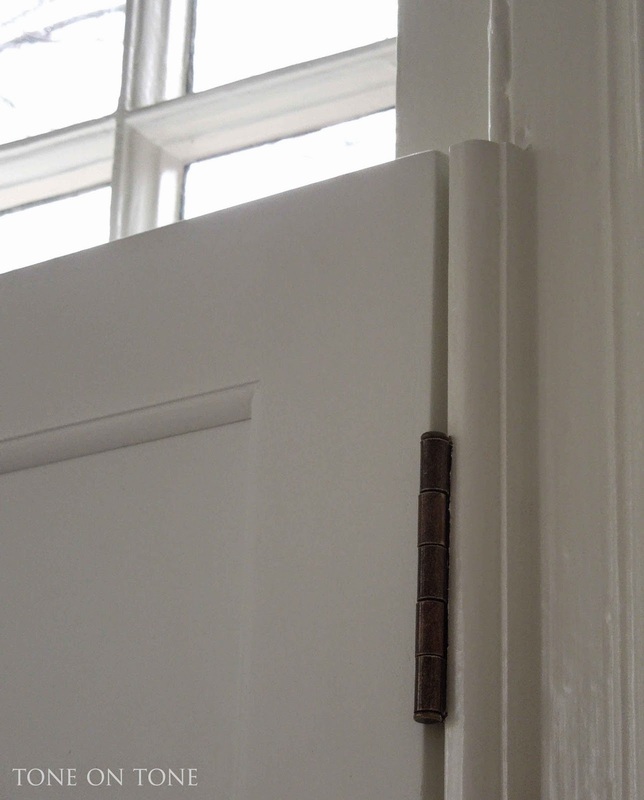 For the shallow-depth windows, carpenter Mark Maltezos compensated with a clever molding strip attached to the stiles. Great work, Mark! 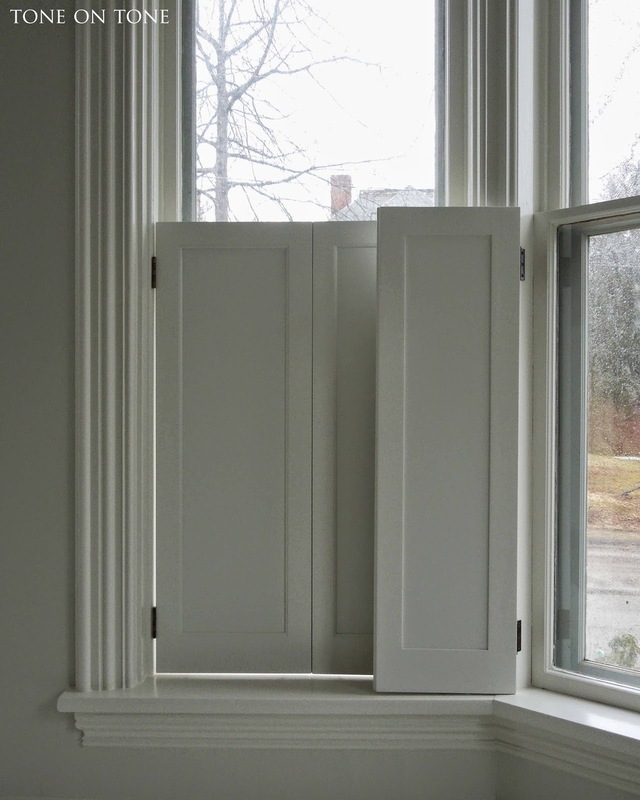 All the window shutters were custom made by the talented Fred Mitchell of Shutter Works in Lewiston, Maine. We love our shutters, Fred. They turned out really nice. 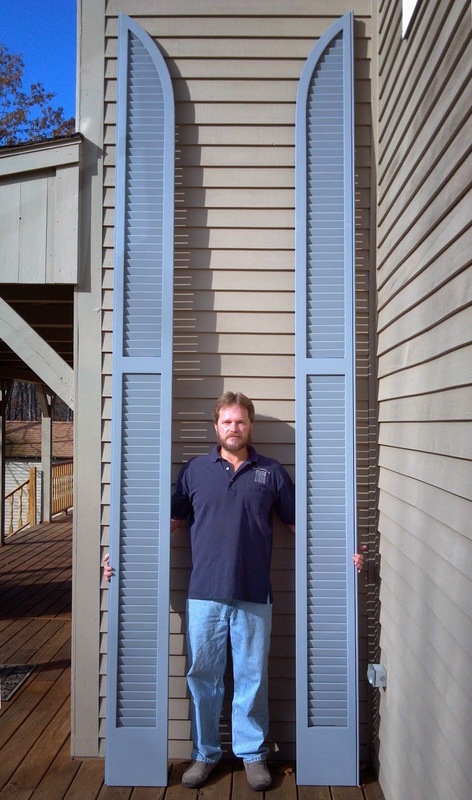 Below is Fred with a pair of custom shutters for another client - now those are cool! I'd love to see them in situ. BTW, Shutter Works will ship out of state. Tom and I would like to thank Dan, Mark and Fred for their fine work. We are grateful to each of them! Gotta run and help Tom pack - wish us luck!! I so enjoy these posts! Thanks for sharing! 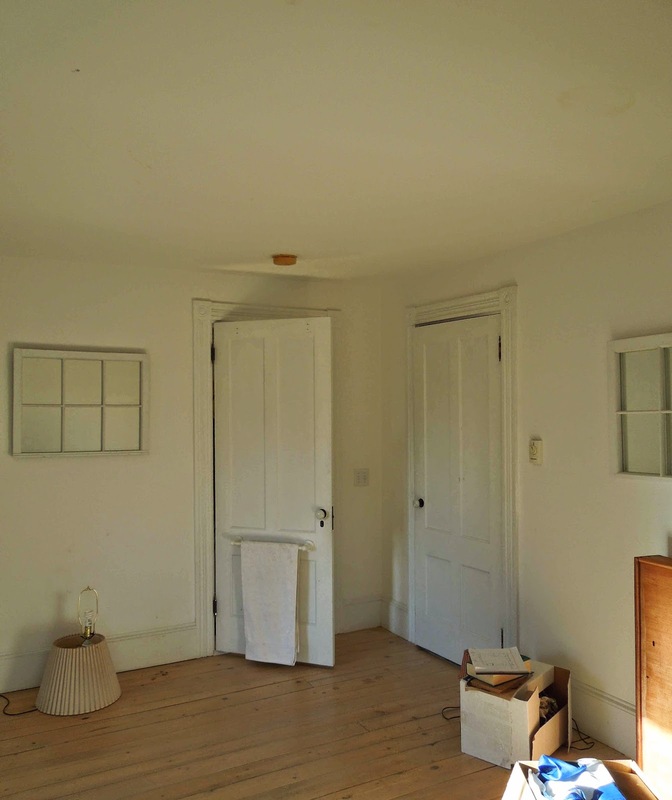 Oh, your Maine home looks so fresh and lovely. I can't wait to see it with your furnishings. Those craftsmen are amazing. Yes, we are grateful to have such a wonderful time! I am so excited for you! I know that it will be beyond stunning when it is complete. The colors are so lovely and soothing! They will be such a wonderful backdrop for all your beautiful things! Looking forward to seeing more! Loi, thank you so much for showing us the progress on this wonderful vacation retreat! Your team has done an excellent job and I am so excited to see your wonderful pieces arrive! Wow, Loi, I love it all. I would love to get an old house to renovate. Can't wait to see more. the image of the boat framed in gold against the gold..... love!!! Wow Loi, looks like a big project. But you and Tom are progressing well. 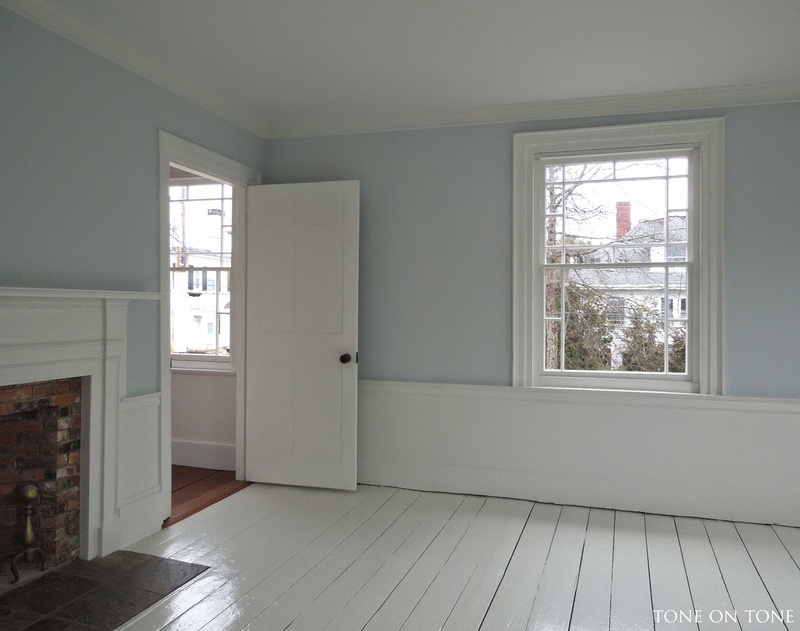 I like your grey paint with the white trim and the Blue Sky room. So chic. Your shutters are beautiful. Looking forward to the finished house. Enjoy your Easter Weekend! You've accomplished so much and it's looking great! I love the gray especially in contrast to the peeks of the dark wood of the banisters and the mantel. Love the interior shutters too. I've wanted to do that since I had my new windows put in but it's just never happened. You're also giving me permission to paint the floors in my guest room. Thank you! 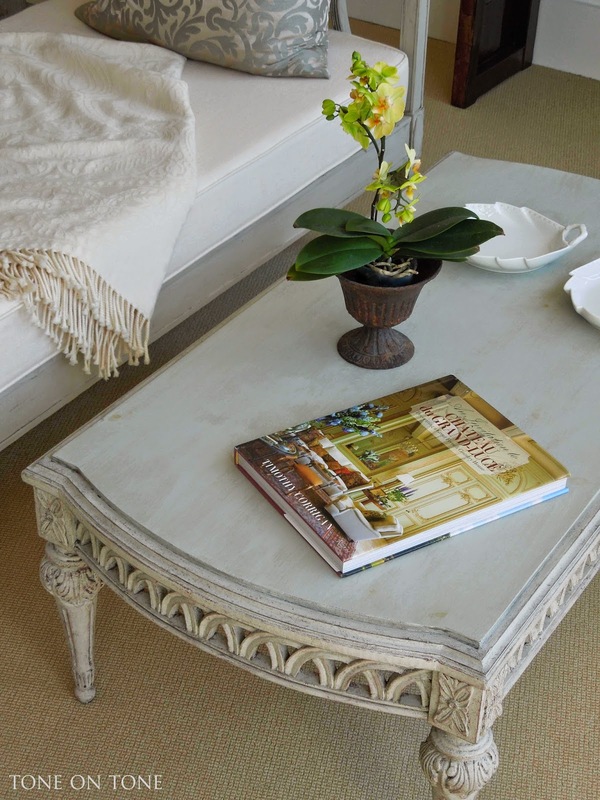 Painted floors hold up well in bedrooms because of reduced traffic. I think your guestroom would look amazing with painted floors, Steve. The most amazing part of all this is just how fast it has been done! So many skilled people involved and yet, in just a few months you're almost there….!!! Congratulations on a beautiful job: well done. Your attention to detail is masterful! I love these progress images. Your home in Maine is going to be beautiful, and most of all restful! Beyond love it!! I love the color choices and those half simple shutters are my favorite!! This will be magazine worthy as well, good luck! I know that one of the best parts about doing our renovation was getting to meet and see wonderful craftspeople at work! Love all of your updates and color choices, and it really reflects yours and Tom's personalities...simply beautiful! 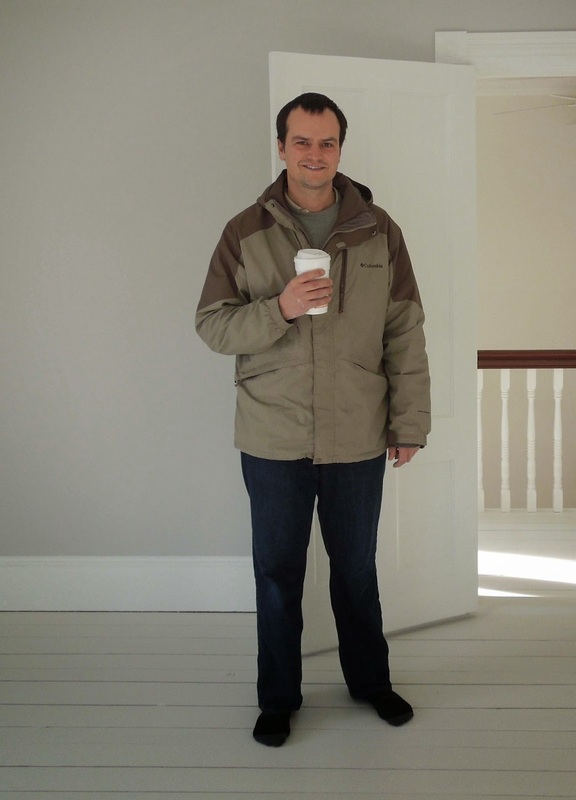 Excellent job by your skilled contractors, and I very much approve of the simple palette upon which to layer your personal very pleasing style. Makes me want to do it again...although the renovation upstairs is very noisy this morning, so it's not a happy thought today! Hello Loi, What an elegant background you are creating for you future plans, which I cannot wait to see unfold. 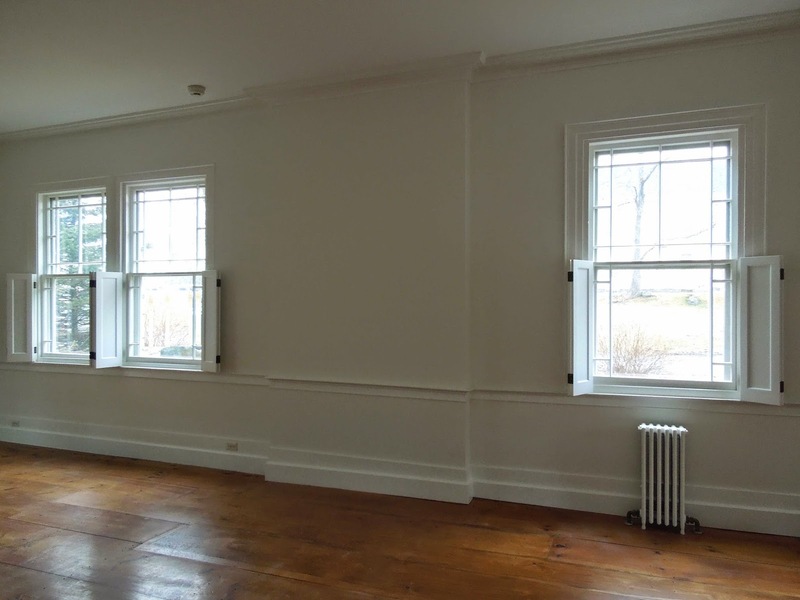 The slight color on the walls really emphasizes your beautiful old woodwork, which we can now see was somewhat lost and receding in the all-white rooms. You obviously appreciate how lucky you are in finding such great craftsmen. When I first saw those tall blue shutters, I was wondering how on earth they could be for your house! Perfection, Loi! The serene color palette and the simple shutters are beautiful, and I love the painted floors. It is the perfect setting for your beautiful things - I can't wait to see the furniture!! Here I am, enthusiastic about EVERY THING YOU and Tom do....my friend, your sensibilities are unmatched. You have such a touch of grey beauty and you are taking this gem and polishing her up to high shine. Every detail you select is perfect in its sparse presence, with no unnecessary clutter. Each piece so beautifully placed then planned. I am so happy for you both that you have found this place to retreat to in summer and care for. Bravo to you dear LOI! And I am always present, but enjoying my time off from posting for a while. I hope you will visit me when I do post again. Thanks so much, Anita. Enjoy your time off, and have a wonderful Easter. Such talent . . . and all so beautifully done. Congratulations on such great progress, Loi! You assembled an amazing group of craftsmen, and they've worked wonders, particularly where that closet was removed and the flooring replaced. 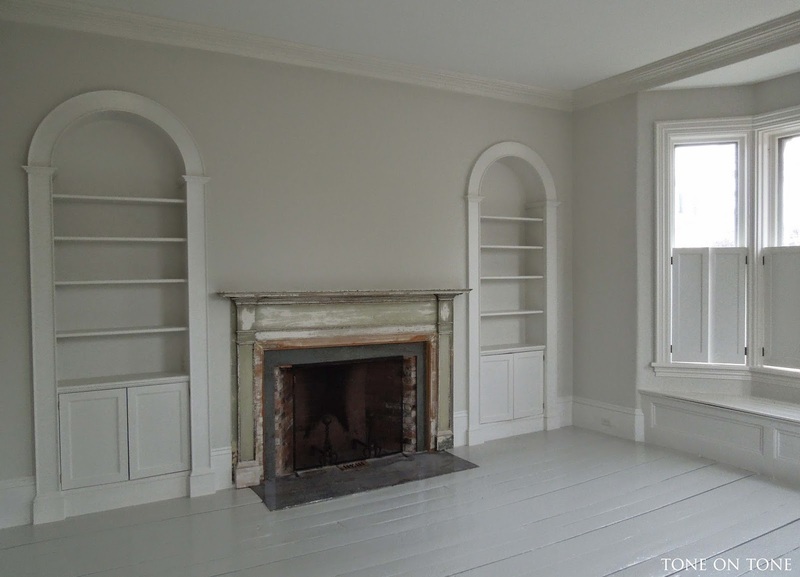 I like that you've used glossy white floors, and I especially like the sky gray room. 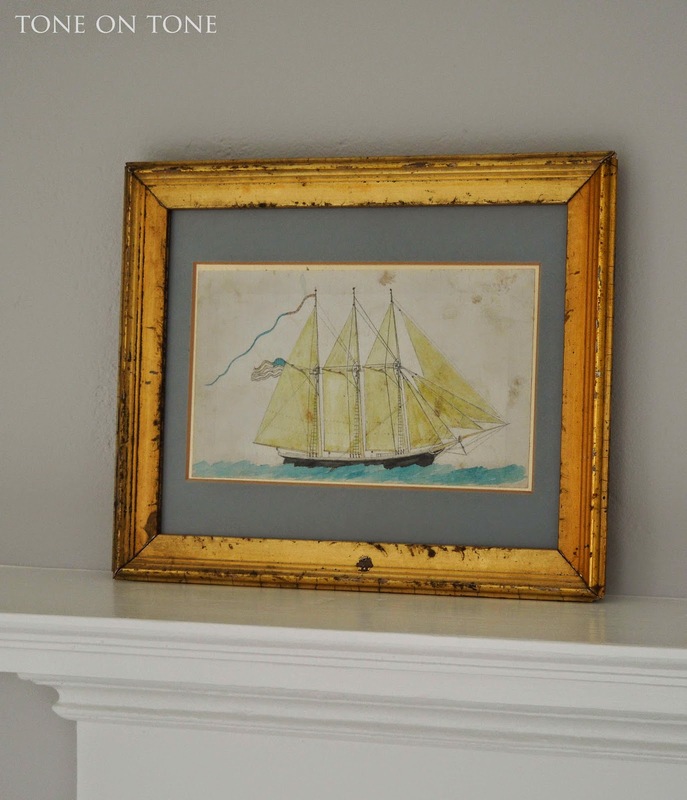 Perhaps that will feature some of your nautical motif . . . Can't wait to see the decorating phase!! Oh Loi … this is going to be gorgeous! The colors are so YOU and soothing and meticulously done. Cannot wait for the furniture move-in! I am predicting a busy but beautiful Maine Summer for you and Tom! Wow, Loi. Things are coming along beautifully. Love the colors you are choosing and all the attention to detail. What a lucky house to have you and Tom find it and make it gorgeous. Can't wait to see it furnished! Congratulations on your progress. I am so excited reading this and seeing your great ideas. Congratulations Loi and Tom. It really is such a lovely house and you are so generous to share it with us! What a great backdrop for your antiques. Back to read it all again as usual. Happy weekend, hope you get to spend it outside! I'm in love with your world of gorgeous grays and how they "play" together! Can't wait to see you both In and Settled!!! I know it will be AMAZING! Loi, LOVE all of your updates & changes. Getting rid of that stair makes for such a great space in the back of the house with elegant proportions, and getting rid of the 3rd arch in the living room certainly helps as well! Everything looks beautiful. Loi...good luck with the move...love the transpiration...its going to look amazing! Wow... love everything you have done. So fun to watch the progress! So exciting to see the beautiful transformation Loi! Have a very happy Easter weekend, and thank you so much for your kind comment and birthday wishes to Patch recently! FAB! The best thing about this house is that the "bones" are top notch. I love that area of Maine...so you have it all. BRAVO! Thanks! We love Castine and the surrounding towns, too. Cheers! I love Timothy's work. Congratulations on the win! Every thing you design reaks of gorgeousness. Love the paint! Needless to say we are HUGELY impressed. And we love the grey which you have used extensively. It does, as you say, create a very classical feel in keeping with the period of the house whilst also having a crisp, clean contemporary edge to it. As for the yellow of your drawing room. Perfect. We have always wished to use a similar colour and now you have possibly spurred us on to change. 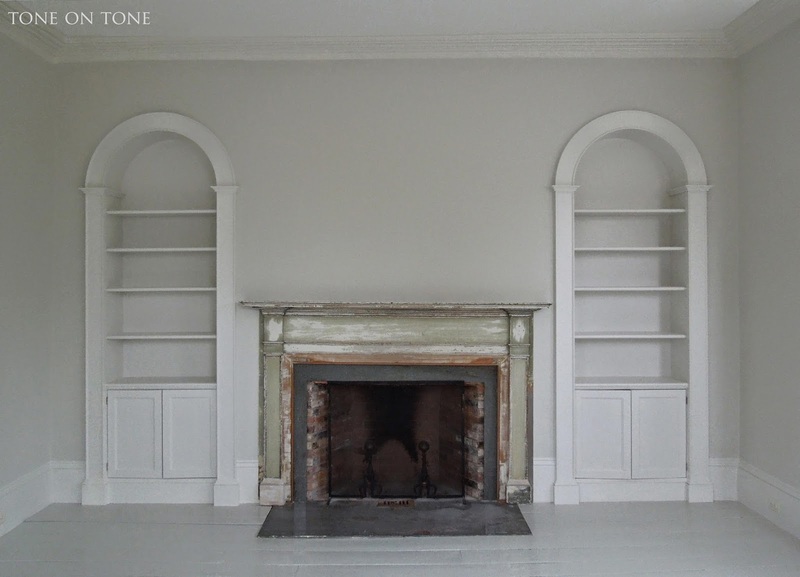 So wise to have been rid of that ghastly alcove over the fireplace which must, surely, have distracted from the overall elegance of the room. I LOVE every little thing you did. It is so gorgeous! Dying to see how beautiful it will look with your personal touch on it. Have fun! Loi.....that wood floor patch is amazing! When you say the paint is %75, what is the other %25??? The home is looking spectacular and so stylish, removing the staircase was genuis! I always make the bottom rail of a panel wider too, good for you! Yes, that is correct. Thanks, Sidney. Hope this helps, Betsy. Gorgeous! We have 10' and 13' ceilings and want to do big baseboards, what size are these? Sidney - Your ceilings are SO tall!!! Lucky you! I'm not 100% sure, but guessing our baseboards are 10" - 12" high. Our ceilings are 10' high on the first floor. Ceilings lower upstairs. As I was viewing your soothing ethereal paint palate, I could feel myself relaxing while enjoying each and every improvement to your summer home. You and Tom are creating a charming beauty to vacation at. One can tell the thoughtful planning and consideration to historic legacy that has gone into your choices. Thanks for sharing. What a fabulous project. Just in time to enjoy the Spring and Summer. So well done. Thank you for sharing these photos. Good luck with the move. Have a wonderful weekend. I am so very impressed with the progress, Loi! Its all just gorgeous. I am so glad to see BM Wickham gray it seems nicely warm without going too greige for me. Hello, Felicity - Thanks so much! Hope you have a wonderful Easter :) Cheers! Loi, I am really envious. Looks so inviting! Did you have to replaster? Or double glaze the windows? Thanks, Vicki! We only had to replaster a small portion of the breakfast room. you never fail to inspire loi, now i am coveting a vacation retreat in maine, tackle a good renovation and perform a total transformation. alas, i will be content to watch you and tom create magic. without furniture or decorations it is lovely. enjoy the process! What type of paint was used on the floors? Did you need to prep them in any way? Yes, the floors were washed, sanded and primed. We used a water based porch and patio floor paint in gloss by Behr. Are you painting your floors? Good luck. I can't tell you how happy and excited I am for you!! This has been such a treat watching you turn this home into the perfect retreat! 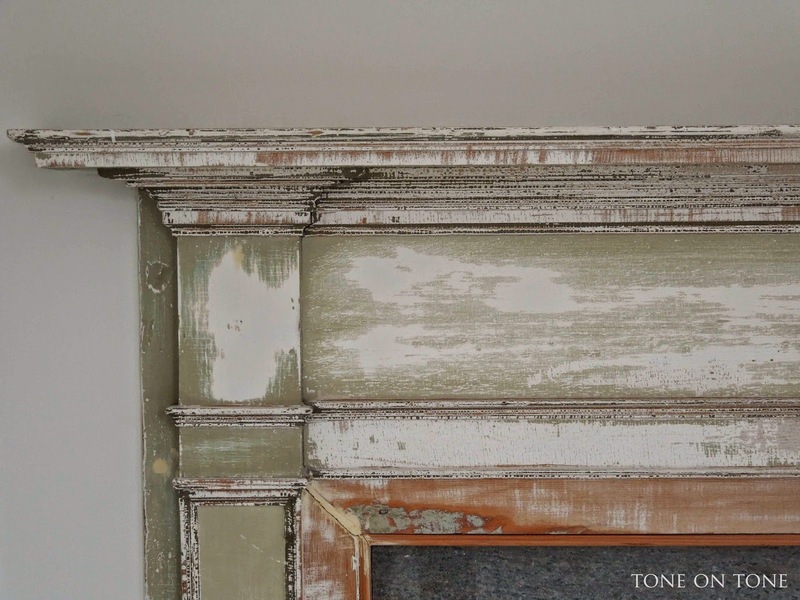 I can't get over the fireplace mantel and how you left the original paint... brilliant!! I'll be dreaming of this home tonight! I want one! Many wonderful years to come enjoying such a historical gem! Beautiful! Congratulations. I so envy that living room mantel. Thank you for sharing pics of your lovely home. Can't wait to see the finished article. The house looks beautiful, Loi. It is a serene haven. I can't wait to see it with the furniture and accessories. Oh Loi, your home looks ready to move in to!!! I love the paint colors you chose, so true to your new homes distinctive architecture!!!! I know your excited but we are all so excited for you! Can't wait to see the furniture pieces that will go into this already gorgeous-looking home!!! Have a wonderful Easter dear! Loving all the colors you chose. So bright and fresh! Love it! I am bowled over by the seemingly simple changes that yield large results! The gray color is sublime and the perfect backdrop. Though if the decor stopped there, it's already stunning. I'm a White Dove girl, as that is the entire exterior color of my house plus all of my trim in our kitchen/family room/mudroom and upstairs addition. You and Tom have done a masterful job so far and once the furniture is in, I'm sure it will take weeks for me to pick my jaw up off the ground. Bravo!!!! Your house looks amazing Loi! What a beautiful place! crusty mantel is beyond. what you're doing is magic. so happy for you two and this labor of love! Gorgeous Loi. Love all the paint colours and those floors...sigh! Heavenly!! Interesting point about the shutter beading/weighting. Such attention to detail and such a great tip. It's great to have found some contractors with such ability and integrity in their work. The house is just gorgeous. You're not going to want to leave!! Hi Loi, Oh my goodness! Everything looks great and you are making lots of progress. We are beginning a similar project with a 30 year old home ;) . 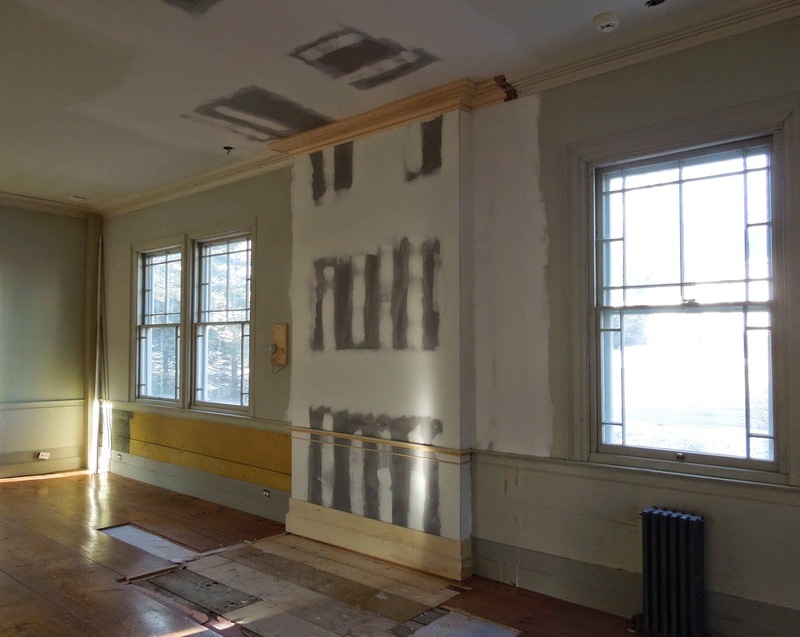 Our plan is to bump out and remove walls so we will have an open floor plan. I'll be sharing photos as we get going. I've used the Ben M. gray, white dove, and also the sky blue. Love them all but I'm considering switching to Farrow and Ball grays .. not sure yet. Your hardwoods are incredible and I like the shelving and details that you are showing here. My blog has changed over to wordpress so you will need to change me on your blog roll to receive updates. Oh Loi you and your team really are doing a beautiful job of bringing the house back to life. Your colour palette is gorgeous and the perfect foil for your incredible antiques. I just can't wait to see what my room will look like! Simply gorgeous! I love the BM Wickham Gray. It's exactly the shade of gray I was looking for when I painted my living room. Too bad I didn't know it back then! Love that you're keeping the house true to it's original spirit but with twist that makes it relevant now. You have made marvelous progress in such a short time. 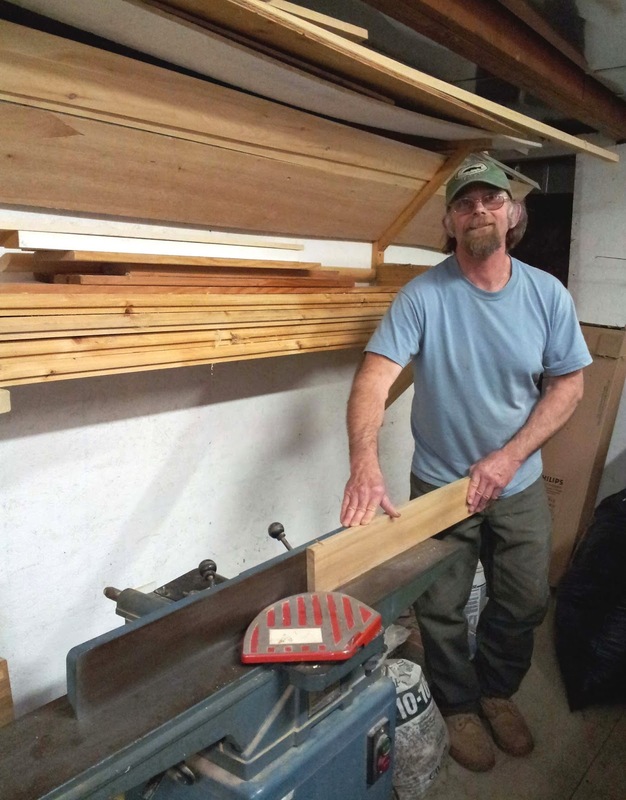 Your contractor/carpenter Mark looks to be a perfectionist. I love the floors. 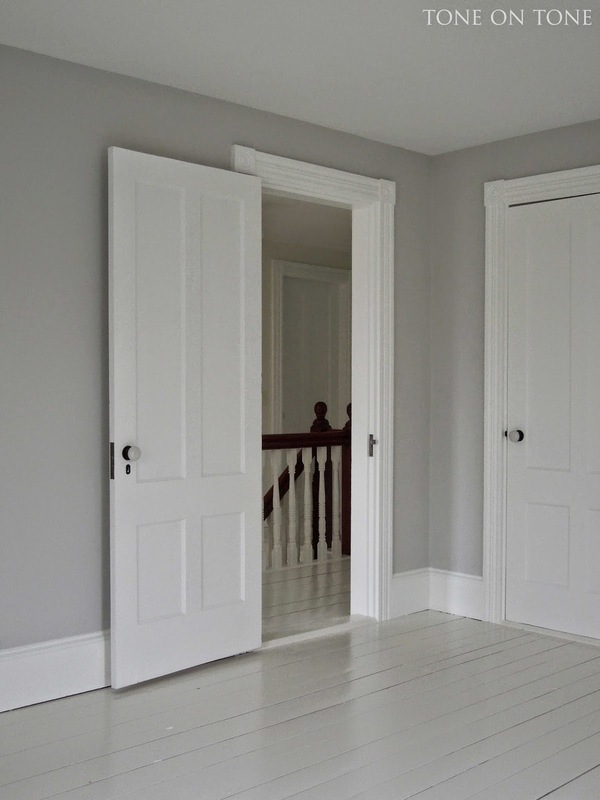 We had painted cream colour floors in the upstairs of our farmhouse and I loved the look. Your choice of paint colour looks fabulous. I will look forward to seeing your furniture in situ. Now if only you could find a way to spend the entire summer and fall in Maine? I have been away so much from blogging and just drop in now and then. 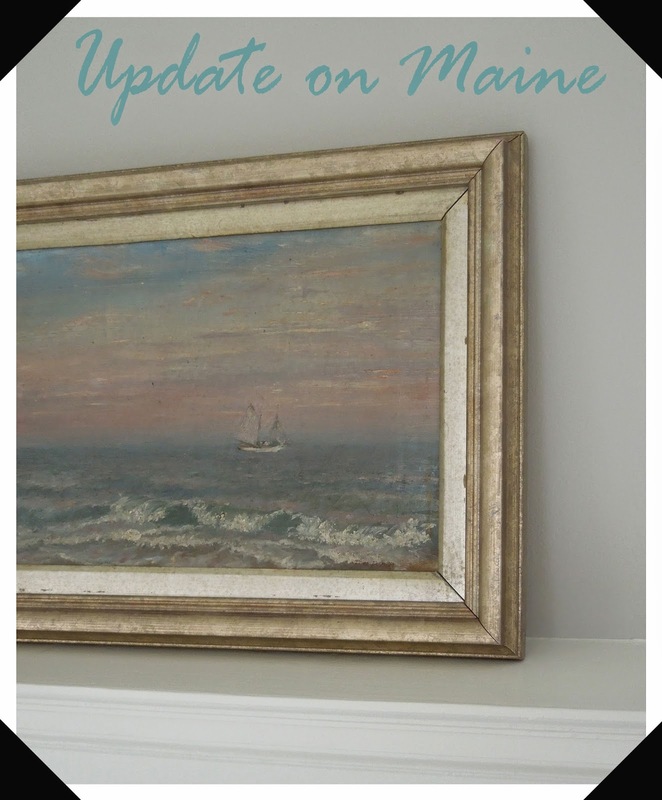 I have been catching up on some of my favorite blogs and am so enjoying yours- such beauty- your new home in Maine, your gardens, furnishings and so much to take in- you never disappoint! Oh Loi-what a stunning home! 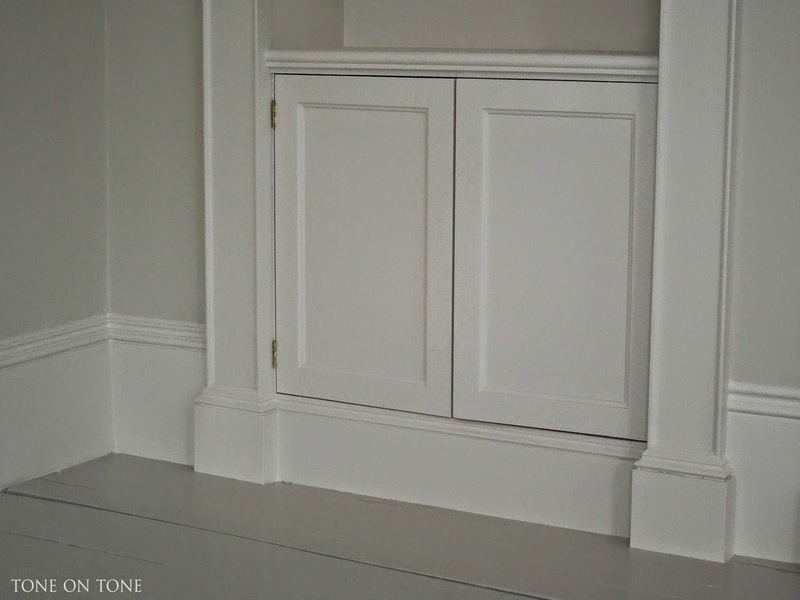 LOVE the removal of the niche over the FP and those painted floors! Will you be gardening in blue and white here as well? Loi, HAPPY EASTER! Everything looks great! I like the grey color on the walls and the floor. I wonder what the final result will be. Your house has a great potential. A Happy and Healthy Easter to you and Tom, dearest Loi! What a splendid renovation! Thanks for sharing the pictures. Can't wait to see the progress. Also, I have to give you a huge thank you for sharing paint colors. I just completed a renovation on my kitchen/living room/den areas and I tried the BM Classic Gray, because of you. I never would have tried it just from the paint chip(thought it had too much green), but it couldn't be more perfect! Thank you so much, I love it more each day! What a beautiful treat for this stomach flu inflicted gal; pure design delight - who knew it could calm the the tummy! Your changes are so pretty and your style is shining through with every redo! I love your new shutters, as well as those blue ones that Fred created for another lucky client ! You have chosen very skilled and talented professionals, and as always, have worked together with them to give life to your amazing vision. You have a remarkable team that have transformed this 200+ year old house so well. Eagerly waiting to see how your magicak touch of interior design will further transform it. I just posted some images from my my friend's shop. The last photograph made me think of you! It is a salvaged, corrugated zinc panel with a floral swag...come take a peek, will you? Loi! This is stunning! I cannot believe that it has only been 4 months! It is going to be fabulous! I love all of the paint colors, dove white is always a favorite. Have a wonderful week! By the way, I cannot remember the month but I was reading Southern Living a few days ago and your wonderful gardens were featured! Looking good, Loi! Can't wait to see more. Have a great weekend! Amazing what a good paint job (and excellent "bones") can do!!! Love it. So cool about your new book. I've been using some of his new fabrics for Schumacher. Ooh, this is going to be fabulous. Congratulations! I love it already and you haven't even put in the interiors, lol. Love it all Loi, absolutely LOVE it! Very nice post! I love the neutral grey color! It would work well with many room and design pieces! Thanks for sharing! So excited to have found you on Pinterest. Your blog is lovely and I look forward to following. 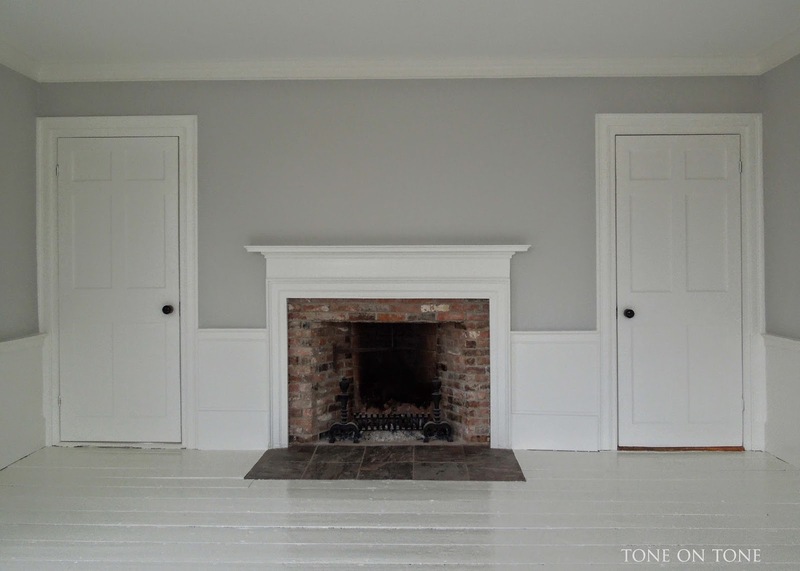 Love every single thing you've done in this post from the painted floors to the shutters. I love the proportions of the rooms! Great taste + exceptional craftsmen = perfection. It's GORGEOUS in a refined taste manner. Would love to know the white you have used with the "gray sky" color? Just beautiful!!! Looking for a pale gray paint color that would go well with a soft blush pink. BM Classic Gray? SW Repose Gray? Thank you for sharing this powerful article, your explanation is clear and very easy to understand. Please kindly visit our site to get more information about airless spray gun solution. Would love to know the floor paint you used, brand and type in particular. I did read it was a custom color. Also how is it holding up? One of the best blog I have seen on your blog. Thank you so much for sharing with us this valuable information. Visit Ogen Infosystem for Creative and Dynamic Website Designing Services. Amazing blog, thanks for sharing with us. Visit Y&H Cargo India for Sea Freight and Shipping Company. Get the best Mutual Fund Advise and Mutual Fund Schemes Investment at Mutual Fund Wala. Thank you so much for sharing this valuable information with, keep it up for more information.